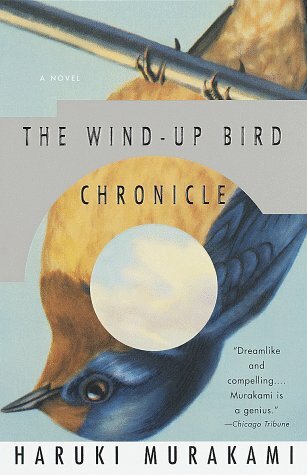 I have just finished reading Haruki Murakami’s The Wind-Up Bird Chronicle. I thought I should begin to address my ignorance of Japanese literature, and I began with Murakami because I was familiar with his book on marathon running. I chose The Wind-Up Bird Chronicle because I was intrigued with the description on the cover: “In a Tokyo suburb a young man named Toru Okada searches for his wife’s missing cat. Soon he finds himself looking for his wife as well in a netherworld that lies beneath the placid surface of Tokyo.” Murakami’s novel provides many illustrations of the stages of ascent and descent outlined in Joe’s contest, notably falling asleep and entry into dream worlds; signs, portents, and oracular dreams; descent into the unconscious, into the horror of past war crimes, and literal descent into a well: “The best way to think about reality, I had decided,” Toru Okada says, “was to get as far away from it as possible – a place like the bottom of a well, for example. ‘When you’re supposed to go down, find the deepest well and go down to the bottom,’ Mr. Honda had said.” Among the many recurring motifs in the novel is the use of birds, including the mysterious “wind-up bird” that features both in the main plot and in the interpolated stories known as “The Wind-Up Bird Chronicles.” I won’t try to summarize this complex novel, nor to catalogue the elaborate variety of ways in which it employs the various stages of ascent and descent. It is a multi-layered, sometimes fantastic, always readable work, by a Japanese author who is steeped in western influences, and it was one of my more memorable recent reading experiences. Though be warned that the descent into the wartime past is not for the squeamish: it’s absolutely an experience of horror. Other moments have a rare lightness of touch and charm. Put The Wind-Up Bird Chronicle on your shopping list. This entry was posted in Literary Criticism on December 10, 2009 by Russell Perkin.